Folks, be ready to be amazed. Not shortly after Nintendo released the Nintendo 3DS, they have dropped another bombshell. It's soon to be the age of the Nintendo 2DS. Face it, 3D was so 2010. You know that, I know that, and certainly Nintendo knows that. That's why we have been graced by this announcement. 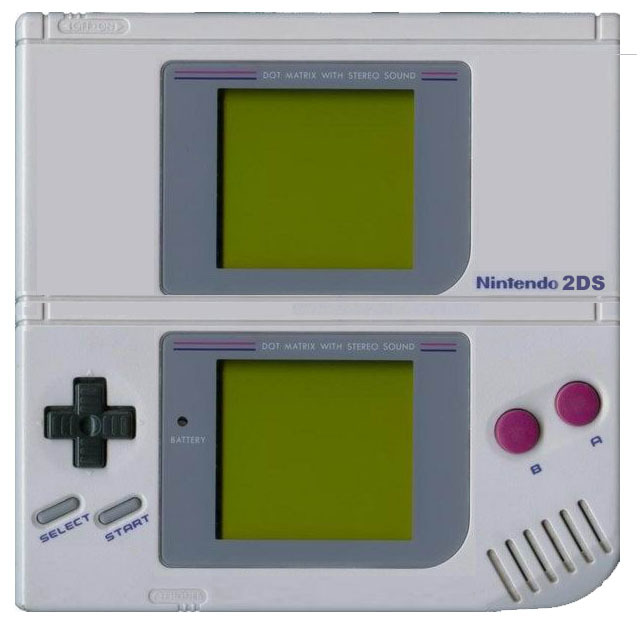 The Nintendo 2DS offers to provide the best that a 2D Dot Matrix can provide. While details are scarse, we are aware that New Old Super Mario Bros has been announced, and as a Mario fan, I am completely excited. More on this development as it arises. For now, rejoice at the news that 2D gaming is making a triumphant return to handheld gaming! I would preorder this bad boy ASAP. Jim Sterling thinks your 2D console is S***! The games sucked and you liked it as a kid. Kids are STUPID so of course everything you liked as a kid is automatically certified S***! Don't get me started on licensed games, I bet it has iCarly and Diego and other s****y games that kids like. If you don't like it then F*** YOU! Quick, somebody convince Ben Heck to make this thing! I know this is a joke but I'd buy one if it was real. Just wanted to stop by and congratulate you on so effectively predicting the future! Haha, ironically with the actual announcement of the 2DS, Google will now deliver this article to even more people than it was originally intended for. Just saw Vooks share this on their Facebook page. I can't promote this to the front blog - it was already promoted back in 2011 for our 2D Generation Day! Quick, someone notify Dave and let him know that Nintendo stole his idea. @Slowman: Hahaha! I love it. It's finally time our site got some love from Kotaku. I emailed Dave already. Dennis knows too. Tweeted it out as well. Hello people from Yahoo and Kotaku! @Alfador: Alfador! Long time no see!